It is the story of the Little Church opening its doors for the funeral of actor George Holland in December of 1870 that sparked a legacy of support and openness toward New York's performing arts community. This legacy continues to burn brightly in the work of upstairs neighbor The Episcopal Actors' Guild, and is on display each November at the Annual Memorial Service. During this unique event, artists and audiences gather together to honor and celebrate those in their community who have passed away in the previous year. The Church of the Transfiguration and EAG have presented at least 55 Annual Memorial Services, each featuring an afternoon of music and reflection, as well as a reading of the names of those being remembered, which is always followed by a heartfelt standing ovation. A highlight of the service is a special address by an esteemed member of the performing arts community. Over the past 55 years, this address has been delivered by notable artists including Sam Waterston, Marni Nixon, Arthur Anderson, Joan Fontaine, Celeste Holm, Earle Hyman, and Barney Hughes. Last year a packed church was treated to a moving reflection by legendary actor Frank Langella. This year, EAG is pleased that actor Reed Birney has agreed to make the memorial address. Birney has had an incredible career, including numerous Broadway shows like this season’s production of 1984, as well as Casa Valentina, All the Way, and The Humans, for which he won the 2016 Tony Award for Best Actor. He can also been seen on shows like House of Cards and The Blacklist. The memorial service is held in the sanctuary of the church, is led by Father John David van Dooren, and will include music by Claudia Dumschat and the church’s famed Men and Boys Choir. 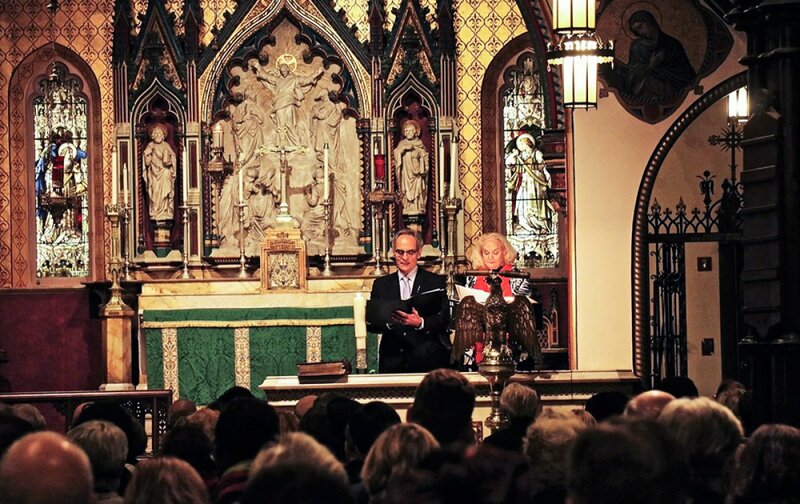 All readings will come from The Edwin Booth Bible, which belonged to the legendary actor and was presented to the church by The Players Club in 1893. This year's service takes place on Sunday, November 12 at 3 pm, and is open to people of all faiths and backgrounds. We hope you can join us.